The Russia-made Mi-17 is one of the world’s most advanced military transport helicopters. Although the cause of the accident is yet to be ascertained, prima facie it looks like the aircraft became entangled with iron girders while landing, according to a local resident. 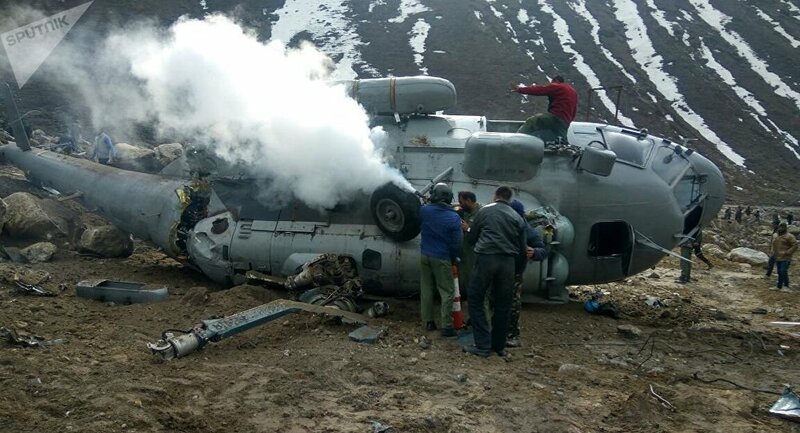 New Delhi (Sputnik): An Mi-17 helicopter of the Indian Air Force (IAF) has crash-landed in the Kedarnath valley of the Himalayan state of Uttarakhand on Tuesday morning. Six people, including a crew member, have reportedly faced minor injuries during the mishap, which occurred when the helicopter was conducting a sortie carrying construction material. "The weather was clear. Reasons behind the crash are unknown. One crew member faced leg injury. Other five has been discharged after the normal check-up," Mangesh Ghildiyal, Rudraprayag's district magistrate told Sputnik over the phone. A local resident told Sputnik that it looked like the pilot lost control after the helicopter and got entangled with some iron girders while landing. The Russian-made transport helicopter was carrying construction material for the ongoing reconstruction of the ancient Kedarnath shrine. Personnel of the Nehru Institute of Mountaineering and local administration were pressed into action to rescue the crew. The Mi-17 helicopter played a major role in rescue operations when the Kedarnath valley was partially devastated by massive landslides and floods in 2013. Since then, the helicopters have been assisting in the reconstruction works in the area that was washed out by the floods.